Sure You Have Enough Tickets? How Many Tickets Do You REALLY Need For Your Event? First, we want to answer a common question we get about tickets: "Why use tickets at all?" and "Why not have folks just pay with cash?" Well, we have two main reasons for recommending the use of tickets instead of cash or credit cards for games, rides and food at your event. See the details below! In addition, keep reading because we have a brand new FREE Online Ticket Calculator that helps to give you a rough estimate of tickets you can expect to use at your event! We also have a few suggestions below to help you think through how many tickets you will need for your event. There's also an awesome & unique tip below - so stay tuned! Most carnival and festival tickets are sold in rolls of 2000. That sounds like an absolute ton of tickets. How could you run out of tickets?! Just grab a few rolls and you are good... right? Nope, not so fast! 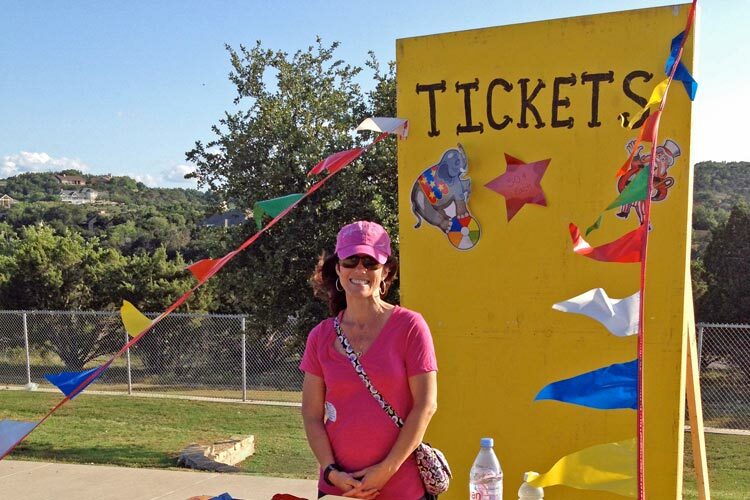 Many carnivals and festivals use different types of tickets for many things. First, Tickets Keep All Lines Moving Quickly! 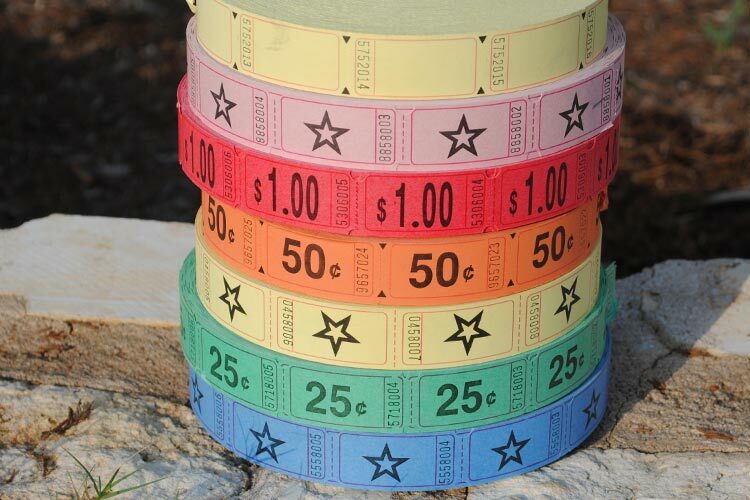 Many carnivals and festivals use tickets for every purchase at the event (with the exception of the silent auction.) This a great idea because carnival-goers pay at one location for food, games, activites, raffle tickets, and more! For obvious reasons, having folks place a ticket in a box is a much easier process than needing to make change for event-goers at each booth! We hate to be bearers of bad news, but sometimes cash is lost (or even stolen!) if not watched carefully at a big event. Many carnivals make sure there are at least two adults who handle the cash and give change at a busy ticket booth. Tip: It is smart to have a carnival chairman occasionally empty the large bills from the cash box to being locked in a secure room to keep the excess large bills safely stowed away. In addition, if you have a central ticket booth, you can also have a handheld phone attachment that acts as a credit card swiper and allows you to accept credit card payment for tickets - something we could not do 10 years ago! Of course, you will need to have a credit card account to take care of the details, but you get the picture - not every booth will have this technology! So... How Many Tickets Do You Need? Most carnival and festival tickets are sold in large rolls of 2,000. That sounds like an absolute TON of tickets! You may be thinking "I will just buy 5 rolls of tickets, which is ten thousand tickets, so we will be good!" ...Not so fast! Many carnivals and festivals use tickets for many things. There are tickets for Food & Drink, Games & Activities, and Raffles to name a few of the most common ways tickets are used. 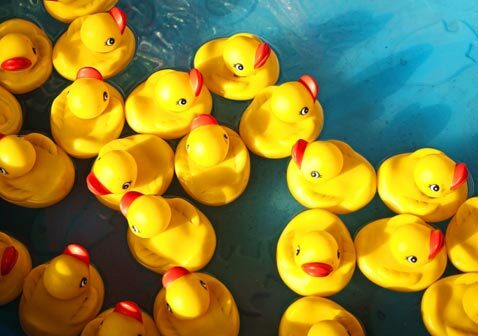 In figuring out how many tickets, it is a good idea to determine if you plan on having a different tickets for your different activities - which is something we highly recommend! Generally fundraising carnival or festivals will use tickets for all food items. If this is your first carnival it may be a great idea to have the food and drink tickets have a value of $1 each and round up (or down) each food item so it costs an even amount of tickets. 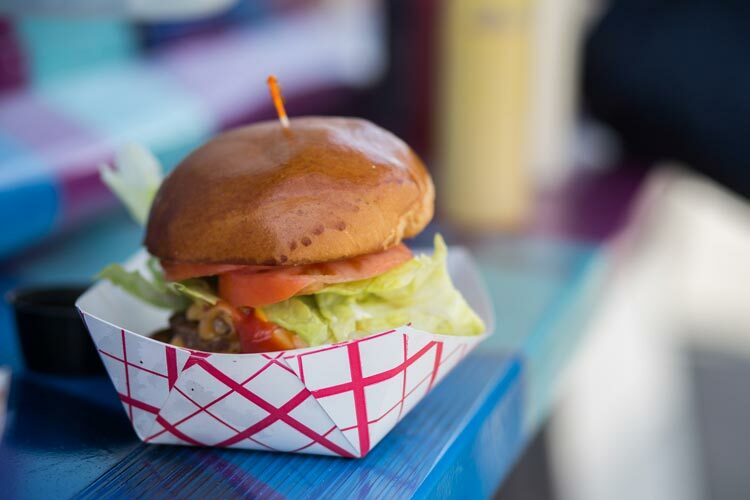 For example, if your ticket value is $1 for all food items, you can charge 1 ticket for a bottle of water or soda, 2 - 3 tickets for a slice of pizza or a hot dog and 4 tickets for a burger. So how many tickets do you need for food and drink? You can get a rough estimate by multiplying the number of carnival visitors by and estimated amount each person will spend on food and drink. For example, if you have a carnival with just snacks like popcorn, cotton candy and drinks - you may decide that average amount spent of food per person is estimated at $5. But, if you have your event during a lunch or dinner hour - count on most folks spending more and you may increase that amount to an average of $10 per person. Once again this is an estimation - but the math would look like this: (#carnival goers) x (average amount of money each person will spend on food & drink) = number of tickets (if ticket value is $1.) If this just gave you a headache, then feel free to check out our FREE Ticket Calculator! 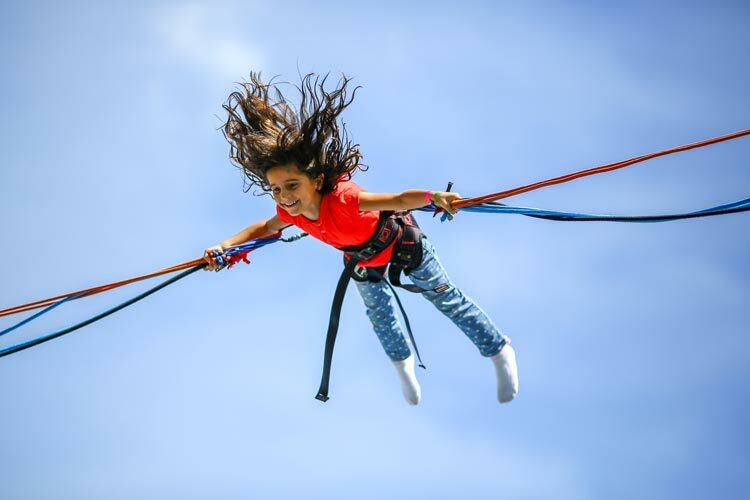 Girl having fun at the Euro Bungee Jumping Booth - a premium activity at a carnival! For the carnival games, your recently we have seen that an average ticket value is about 50 cents each. Individual booths will charge a different amount of tickets for playing each game or for each carnival activity. For example, it may cost 1 ticket (or 50 cents) to play the Bean Bag Toss Game, 2 tickets to play the Fishbowl Game (because the top prize is a little more expensive) and up to 14 tickets (or $7 dollars) for a premium activity like Euro Bungee Jumping (shown in image above)! 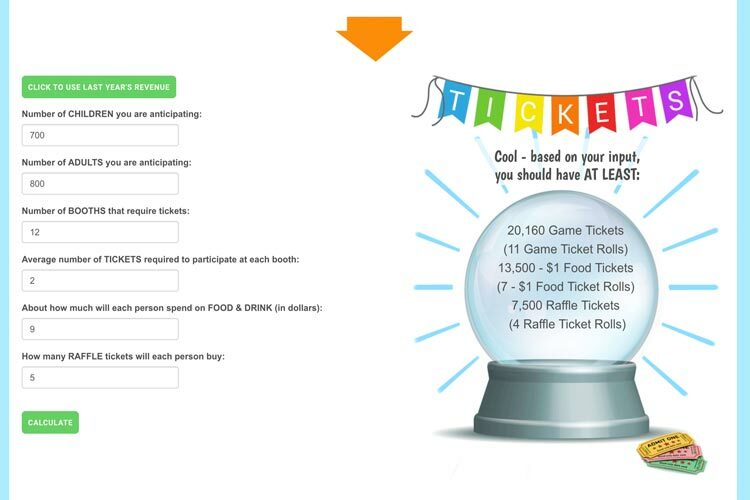 So how many tickets will you need - typically you can get a rough estimate by multiplying the number of children who are coming to your event by the number of games or activities that require tickets. Next multiply the average number of tickets requested for each activity and then if you want get really fancy, multiply by 1.2 assuming some kids will play some games more than one time. The equation looks like this: (#children x #games) x (average #tickets per game) x (1.2) = total number of tickets as a bare minimum! 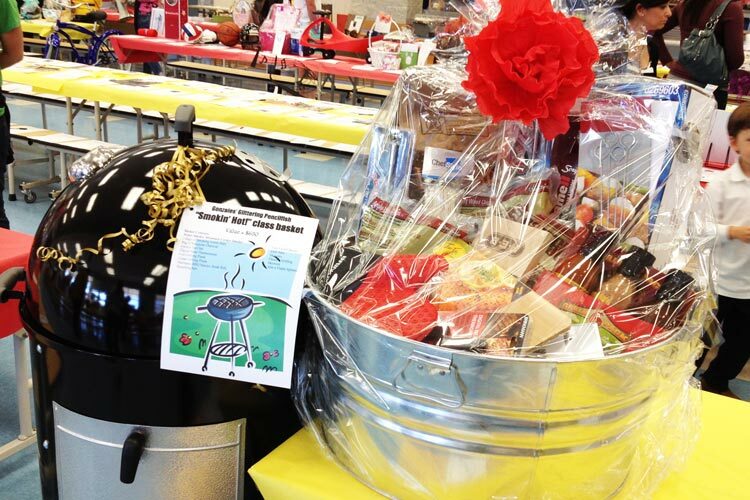 "Smokin' Hot" Class Raffle Basket - includes a food smoker and oodles of bar-b-q supplies! Some school fundraising carnivals use separate tickets for Class Raffle Baskets as well - valuing those tickets about $1 each. A Class Raffle Basket is typically a themed basket in which everyone one in the classroom is asked to bring an item or two that will make this basket a fun gift! Generally, someone will donate one or more of the larger items (in the image above the "smoker") or a handful of parents will go together and purchase the big ticket item and the rest of the class donates the extras that make this a fantastic package to win! So how many raffle tickets will you need for this activity? It depends on participation. If this is your first carnival, maybe survey a dozen - 2 dozen or more parents as to how much they are planning on allowing the kids to spend at the Class Raffle Baskets for a chance to win. Also, parents may spend more money as an "impulse buy" because typically these baskets turn out fantastic and why not spend another $5 for a chance to win a awesome basket and help out your school at the same time? Quick Tip: Raffle Tickets are sold in Double Rolls of 2000. Having twin tickets that say "drop this ticket" and "keep this ticket" with both ticketes having the same unique number. We have found that many schools find the double rolls of tickets not necessary. They simply use single tickets (which save money) and have raffle purchasers write their name and phone number on the back of each ticket before inserting into the the box of a particular raffle for a chance to win! Check Out our FREE Ticket Calculator! Of course you can do the math yourself for an estimate of the tickets you need or you can use our BRAND NEW Carnival Ticket Calculator! Feel free to check it out and run some figures. At the end of the day you want to be sure to have more tickets that what you estimate you will need as we mentioned before, running out of tickets at your carnival is a disaster! Carnival visitors who want to buy food, drink or extra tickets for games and raffles are disappointed while the carnival committee sends someone to a local store hoping to find tickets in stock and get back to the carnival fast. Note: we found local stores charge on average $10.99 for Double Roll Tickets that we sell for just $6.75! So add a few extra ticket rolls to your order so you can sleep good at night and know you are ready for a great turnout at your big event! Thank you for reading the Carnival Savers blog! Feel free to check out the rest of our blog for even more carnival hints & tips to save you time and money.